Into Day 10 of the Blog Every Day In May Challenge and this one is a doozy. I struggled with it. Most embarrassing moment. I’ve had many of those in my life. One that sticks out right now is one of my many multi-level marketing (MLM) ventures when I was new to the “real world”. This was before smartphones and online communications and purchases. I ordered my start-up kit, set up a presentation date at my tiny apartment, bought lots of food and drink, borrowed folding chairs and a table, confirmed guests, and practiced my presentation. On the chosen date, I set everything up. I was nervous, but my recruiter arrived early to walk me through everything. My mother arrived, my aunt arrived, and…no one else did. All that planning, all that anticipation, and…epic fail. I did my presentation anyway. My mother and aunt were supportive participants, but I was crushed. Utterly embarrassed. Many years later, I hosted a similar presentation at my home. That same aunt arrived, and my cousin, and…no one else did. All those same feelings resurfaced from the time before. But I was OK. I was grateful that I can always count on my family to be there for me. What is your most embarrassing moment? Spill it. Ugh, that's one of my worst fears. I'm so sorry that happened to you!! 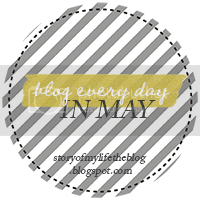 #BlogEveryDayInMay helped me flesh it out. Having a great time with the challenge, Jenni. How terrible people confirmed and didn't show, that is just plain RUDE! I would have been angry, not embarrassed. Better luck if you try it again. I don't put a whole lotta stock in RSVPs after that situation. Thanks for stopping by, Sandy! More in common! Are you still dabbling in MLM? I've done a couple. My Mother is a Premier Jewelry Consultant and she has had people plan parties and no one shows up. THat happens to the best of them. I've done Avon, Mary Kay (twice), and Jewel Kade. I may revisit one of them again someday. But for now, I'm inactive. I like that online sales are an option. Don't have to do the parties solely anymore.